Brief Synopsis – A group of wandering vampires get a new teenage initiate after he falls in love with one of the young females. My Take on it – As you all probably know by now, I’m not the biggest fan of movies with a horror slant to them and that obviously includes vampire films. This one was a bit too dark for me to really appreciate, but there were still a few aspects that I did enjoy. I actually found it quite funny, that Director Katheryn Bigelow employed a number of her husband (James Cameron)’s actors from Aliens (1986) for this film. 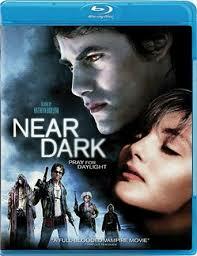 Seeing Lance Hendrickson and Bill Paxton (among others) as vampires just didn’t work as well for me tho. I liked the way that they portrayed the effects of sunlight on vampires using some cool special effects, but I was slightly put off by the amount of gore used here. This is my final review of all of Kathryn Bigelow’s films (to date) and I must say that this isn’t the worst of the lot, but it’s also far from the best IMHO. Bottom Line – A bit too dark for my taste. The story isn’t really too intricate which makes for easy viewing and the special effects are done nicely. The cast is filled with lots of Aliens (1986) alum which makes it a bit funny to watch. The gore is a bit much for me here, but I liked the way they dealt with Vampires and sunlight. Not even close to being one my favorite Bigelow films, but also not the worst. Nice review Rob 🙂 I’ve watched this film a couple of times and each time I WANT to love it. The premise is great. White trash vampires in a trailer van lol. But I think it’s actually pretty rubbish. What you said about it being like Aliens IS funny, you’re right! 🙂 nice observation.